True confession: I have a long history of a passive-aggressive relationship with fruit. I get it with the best of intentions to eat it because I know it’s good for me. I buy different types of fruit that I’ve never tried before in hopes of finding one I will actually enjoy. But more often than not, it sits on my counter neglected to the point of having to be tossed onto the compost heap, leaving me feeling guilty and ashamed. All I can say is it’s on a long list of things to discuss with a therapist. So true to this pattern, I bought my first pomegranate a couple of weeks ago. Day after day I would think about eating it. It’s the thought that counts, right? Today I realized that if I didn’t fix it soon, it would no longer be edible, so I got on the internet and watched several YouTube videos on how to deseed and juice a pomegranate. Then miraculously, I got myself into the kitchen and actually tried it myself. OMG!!!! So yummy. So easy. So quick. How could I have waited so long to discover this wonderful fruit?! To my great chagrin, the three produce departments I called today all told me that pomegranate season is over and they will not be carrying any more until the fall. Boo hoo! 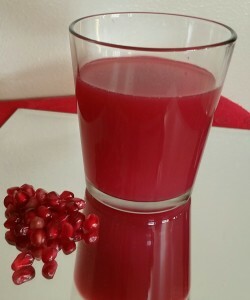 (and yes, I realize what a charmed life I have if this is my worst problem) According to Wikipedia, pomegranate season is from September through February, so I’ll keep checking with other markets to hopefully find some pomegranates to use for my Valentine’s brunch in February. Moral of the story: Carpe frutus! Seize the fruit!